Next month voters will consider Proposition 6, which would roll back the additional transportation funding approved by SB 1, the transportation and gas tax law. Millions of dollars of transportation funding and important investments in active transportation, public transit, local road maintenance, and bridge safety would be eliminated. Not only does the measure repeal SB 1, but it also amends the state constitution to require voter approval for any new or increased taxes and fees for future transportation revenue increases. Prop 6 is bad for transportation, bad for public transit, and bad for air quality. 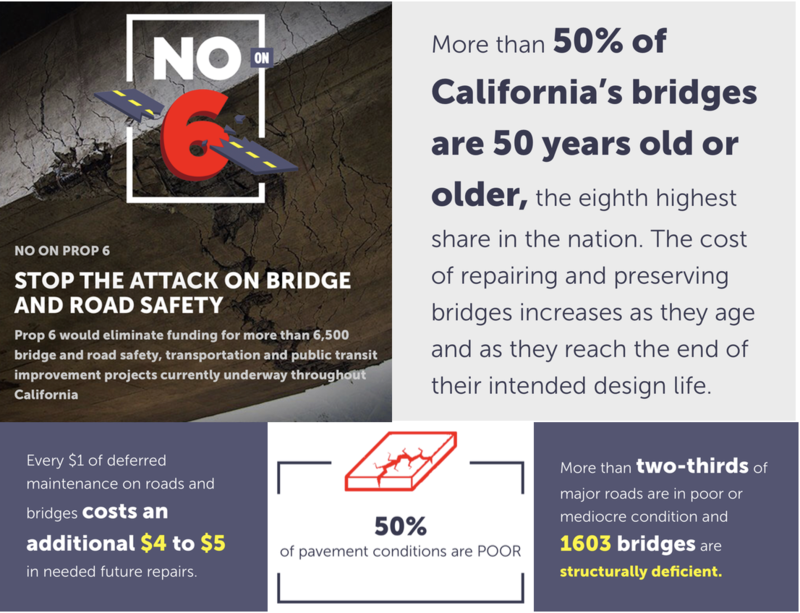 $5 billion annually in existing transportation funds and stop funding for more than 6,500 projects currently underway throughout California – including repairing potholes, repaving roads, bridge and road safety, transportation and public transit improvements. $750 million annually for local transit operations and capital. $100 million annually for the Active Transportation Program grants. $25 million annually for local sustainable planning grants. $7 million annually for UC and CSU Transportation Research. 68,000 jobs and $183 billion in economic investments as thousands of road construction projects are halted. As it now stands, California has a need of $13 billion annually over the next 10 years, just to bring the state highways and local roads into good condition. Maintaining a functional transportation system relies on user fees from drivers and SB 1 links road usage with maintenance needs by taxing gasoline and charging owners of electric vehicles $100 annual fee. Californians are registering to vote in record numbers. Nearly 1.5 million more people are registered to vote than were in the last midterm election in 2014, according to the California Secretary of State’s Office. More than 19 million Californians were registered to vote on Sept. 7 — nearly 76 percent of all eligible voters in the state. It is the highest number of voters ahead of a midterm election in state history. Let your friends and family know more about how Prop 6 impacts their community at noprop6.com, forward this email or share this post on your Facebook page.